Arrive Delhi by an International flight from your place of stay. Meeting and assistance on arrival at Delhi Airport with the representatives of Nature safari and transfer to the hotel. On arrival, check in to the hotel room. New Delhi, the capital and the third largest city of India is a fusion of the ancient and the modern. Standing along the West End of Gangetic Plain, the capital city, Delhi, unwinds a picture rich with culture, architecture and human diversity, deep in history, monuments, museums, galleries, gardens and exotic shows. Comprising of two contrasting yet harmonious parts, the Old Delhi and New Delhi, the city is a travel hub of Northern India. Narrating the city's Mughal past, Old Delhi, takes you through the labyrinthine streets passing through formidable mosques, monuments and forts. You will also discover lively and colorful bazaars that boast to cater all sorts of good and items at mind-blowing prices amidst a barely controlled chaotic ambience. The imperial city of New Delhi displays the finely curved architecture of British Raj. It generates a mesmerizing charm reflecting well-composed and spacious streets under the shade of beautifully lined avenues of trees and tall and imposing government buildings. Morning full day tour of the city. Morning: Visit to the Old City of Delhi to see the historic Red Fort and the Jama Masjid, India's largest mosque from the outside. See the colourful bazaar of Chandni Chowk and take a cycle rickshaw ride through the back streets of Old Delhi to get a first hand experience of the hustle and bustle of this traditional city. This ride through the small by-lanes will be most fascinating. Return to the enroute doing a tour of New Delhi visiting the Qutab Minar, a tower of victory built in the 12th century and India Gate - the war memorial. Drive past the Rashtrapathi Bhawan, the residence of the President of India, the houses of Parliament and the Government Secretariat buildings. Overnight in Delhi. Realize it with a holiday at the capital city of royal Rajasthan- Jaipur. Reach your holiday destination onboard the Palace on Wheels or the Royal Orient with unparalleled style and comfort. Arrive at the first planned city of India that boasts of long association with hospitality and holidays. Besides the trains there's more to tourism in Jaipur. The holiday in India's Jaipur is mesmerizing with the magnificent Mahals of maharajas of the bygone era. On your holiday don't miss the City Palace, Hawa Mahal, Amber Fort and the Jal Mahal. Feel on top of the world with a stay at the heritage hotels. Enjoy the uniqueness of India with the golden glowing sand, the festive spirit in the air and, the colorful people. Morning: excursion to Amber Fort with Elephant ride up to the Fort. Drive past Hawa Mahal, known popularly as the Palace of Winds, is a facade built for the Ladies of the Royal household in the 19th century. The Amber Fort, the capital of the erstwhile State of Jaipur until 1728 is perched on a hill. It has halls of Public and Private audience, a Sheesh Mahal (hall of mirrors) various marble palaces which are marvelous examples of ancient Rajput architecture. The Temple of Amba (Mother Goddess), the patron deity of the Royal family is at the entrance to the palace. Ride an elephant to ascend the hill on which the Fort is situated. Afternoon: city tour visiting the City Palace - the former royal residence built in a blend of Rajasthani and Mughal styles which houses a museum with a superb collection of Rajasthani costumes and armoury of the Mughals and Rajputs, including swords of different shapes and sizes with ornate handles. It has an art gallery with an excellent collection of miniature paintings, carpets, royal paraphernalia and rare astronomical works in Arabic, Persian, Latin and Sanskrit. Also visit the Jantar Mantar - an astrological and astronomical observatory built by Maharaja Jai Singh in the 18th century, which is remarkable for its accuracy even in the present times. Overnight in Jaipur. Morning drive for Ranthambore (166 kms/ 3 hours). On arrival, check in at the lodge. The former hunting ground of the Maharajas of Jaipur, the Ranthambore National Park is situated in Eastern Rajasthan at the confluence of the Aravali hill ranges and the Vindhyan plateau. Two rivers flow through the Ranthambore National Park - the Chambal River in the South and the Banas River in the North. Six man-made lakes and many perennial streams pass through the entire national park. In 1955, the Ranthambore National Park was declared a game sanctuary; and in 1980, it attained the status of a national park. With the initiation of Project Tiger in 1972, it was declared as a tiger reserve in India. 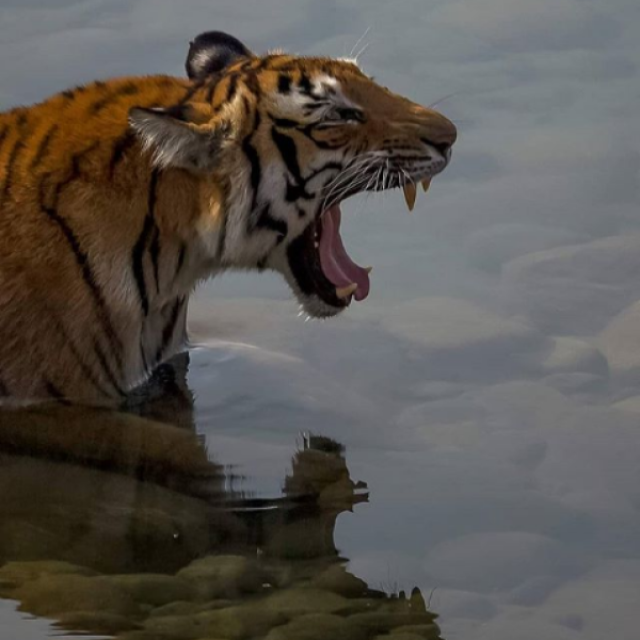 The total area of the Ranthambore National Park is 1,334 sq km along with its adjoining sanctuaries - the Kaila Devi Sanctuary and the Mansingh Sanctuary. 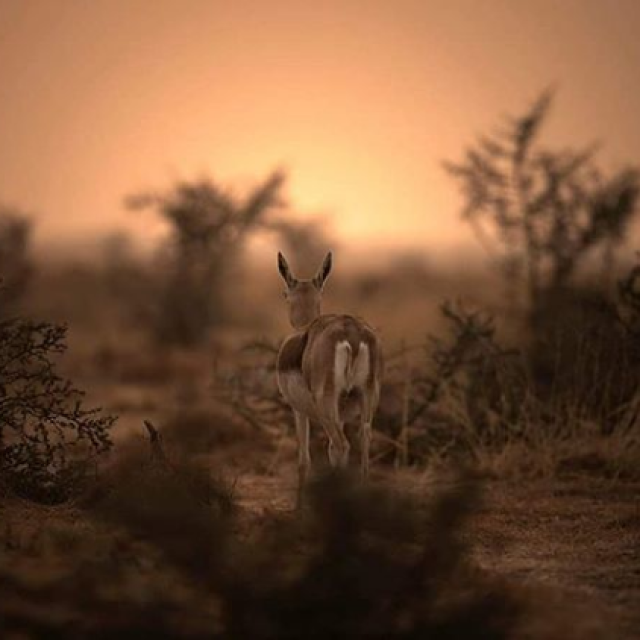 The typical feature of the park is that out of the entire park some areas are open for the tourists to wander in and explore the flora and fauna of the park. The Ranthambore National Park is nestled between the Aravali and Vindhya mountain ranges. The rugged terrain and the dense deciduous forests are major features of this national park, which has among the the largest and most diverse collection of wildlife species in India. Lunch and Dinner at the lodge. Afternoon visit the sanctuary on Jeep. Overnight in Ranthambore. Morning and afternoon visit the sanctuary on Jeep with an English-speaking and a well-trained Naturalist. Overnight in Ranthambore. Morning and afternoon visit the sanctuary on Jeep with an English speaking and a well trained Naturalist. Overnight in Ranthambore. Fatehpur Sikri - This exquisite city built by Akbar the Great in 1569, in red sandstone, with its forts, palaces and mosques was abandoned 14 years after its creation due to political reasons. The Diwan-i-am - a vast courtyard in which the emperor gave daily public audience; Diwan-i-khas - a large quadrangle which contained all the major functions of the Palace, Pachisi court, the Emperors private living quarter, Jodha Bhai's Palace, Mariam's Palace, Birbal's Palace, Hawa Mahal and Panch Mahal are some of the important buildings of this residential complex. The Friday Mosque and the exquisite tomb of Sheik Salim Chisti are in the religious grounds set aside in a separate enclosure adjacent to the secular buildings. Continue drive to Agra (40 kms). On arrival, check in to the room. Agra is famous as the home to one of the Seven Wonders of the world - the Taj Mahal. The architectural splendour of the mausoleums, the fort and the palaces in Agra is a vivid reminder of the opulence of the legendary Mughal empire. Agra was their capital for nearly a hundred years from 1564. A pleasant town , with a comparatively easy pace, Agra is known for its superb inlay work on marble and soapstone by artisans who are hereditary crafts persons. The city is also famous for its carpets, gold thread embroidery and leather shoes. Morning proceed on a tour of the city visiting Visit the Agra Fort, built by three Mughal Emperors starting from Akbar the Great in 1565 AD, which is a masterpiece of design and construction. Within the fort are a number of exquisite buildings including the Moti Masjid, Jahangir's Palace, Khas Mahal and the Sheesh Mahal, Diwane-i-Am, Diwane-i-Khas and Musamman Burj, where Emperor Shah Jahan, the fifth Mughal Emperor, died a prisoner. Visit the Taj Mahal - the inimitable poem in white marble. Built over a period of 22 years, by the Mughal Emperor Shah Jahan in 1630, for his Queen Mumtaz Mahal to enshrine her mortal remains, it is one of the seven modern wonders of the World. Afternoon transfer to Railway station to board the train for Umaria. Leave Agra for Umaria by Utkal Kalinga Express at 1540hrs. Overnight enroute. Arrive Umaria at 0615 hrs. Meting on arrival and transfer to Bandhavgarh (32 kms/ 1 hours). On arrival, check in to the Tiger Den Resort. Bandhavgarh is a strange land. Flowing through a vibrant and luxuriant Sal Jungle, the wind murmurs the songs of nature in the voice of silence. It seems to be quiet. Life appears to be dead. Leaves don't rustle! Water doesn't trickle! Grasses stop to move! Even the wind pauses to hold its breath and watch the drama unfold! Then all of a sudden the Jungle springs to life! Langurs groan. Branches of trees begin to swing under their springing jumps. Fleeting hooves rustle the grass. Heavy bodies splash the water. Spotted Deers let out the alarm call. Let it be known - the King is here - "Hail, the King!" Lesser creatures flee. The King sweeps a gaze over his Kingdom. Period. Utter silence. The show begins. The biggest attraction of this land is the Tiger and its sightings. 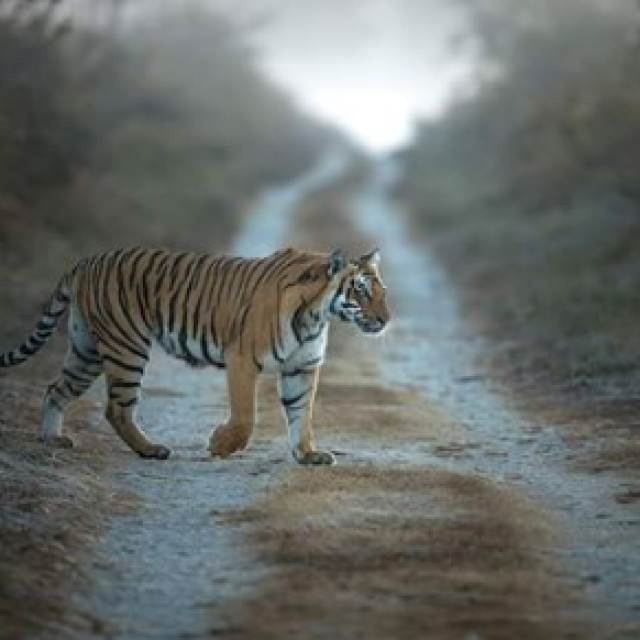 Bandhavgarh has a very high density of Tigers within the folds of its marvelous Jungles. Probably the highest in the world! 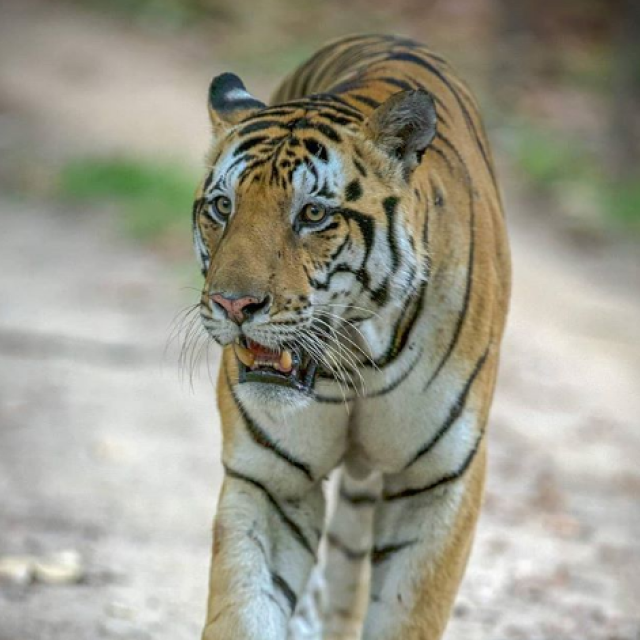 The 105 sq kms of park area, open for tourists is reported to have 22 Tigers, a density of 1 Tiger for every 4.7 sq kms. There is a saying about this park that goes - " In any other Park, you are lucky if you see a Tiger. In Bandhavgarh, you are unlucky if you don't see (at least) one." Lunch at the Lodge and then visit the sanctuary on Jeep/ elephant with an English-speaking Naturalist. During the day, we will have the opportunity to see some of the Bird life in the environs and to visit the village. Overnight in Bandhavgarh. Breakfast, Lunch and Dinner at the Lodge. Morning and afternoon visit the sanctuary on Jeep/ elephant with an English-speaking Naturalist. The Forest Department has devised an ingenuous system of tracking the tiger at this Park. Every day, early in the morning, elephants and their "Mahuts" (drivers) are sent out into the jungle, in search of the Tiger. Once it has been sighted, a radio message is flashed to the Forest Ranger, who in turn informs the visitors in their jeeps, who are then taken on elephant-back, into the bush, to see the elusive Tiger. Overnight in Bandhavgarh. Breakfast, Lunch and Dinner at the Lodge. Morning and afternoon visit the sanctuary on Jeep/ elephant with an English-speaking Naturalist. Overnight in Bandhavgarh. Breakfast, Lunch and Dinner at the Lodge. Morning and afternoon visit the sanctuary on Jeep/ elephant with an English-speaking Naturalist. Take the overnight train from Umaria to New Delhi, leaves Umaria at 2015hrs to reach New Delhi at 1330hrs. Meeting and assistance on arrival at Delhi railway station and transfer to the Hotel. Afternoon at leisure for independent activities, meet Director Project Tiger, in his office, depending on his availability. We shall try and meet him on Day 1 itself when you are in Delhi. Evening transfer to a nice restaurant for FAREWELL DINNER. After the Dinner transfer to the Airport to board the flight for abroad. LEAVE DELHI Depart Delhi by an International flight.